(0 Customer Reviews) | Write Review 4 issues per year We are purveyors of functional fitness! The first magazine to provide in depth content, expert contributors, athlete and affiliate profiles, events, WODs, nutrition and research. We connect the crossfit communities and we encourage you to take the next step - whether it's enhancing your athletic ability or starting your journey into Crossfit - get 'training for life'! What Crossfitters can learn from Bodybuilders. Find out how to look like a beauty but train like a beast. Paleo Nick powers up your nutrition - culinary ninja style. DeMel Tarver unleashes the mind/body connection. Doing the CrossFit OPEN - find 5 reasons you should! We are purveyors of functional fitness! The first magazine to provide in depth content, expert contributors, athlete and affiliate profiles, events, WODs, nutrition and research. We connect the crossfit communities and we encourage you to take the next step - whether it's enhancing your athletic ability or starting your journey into Crossfit - get 'training for life'! 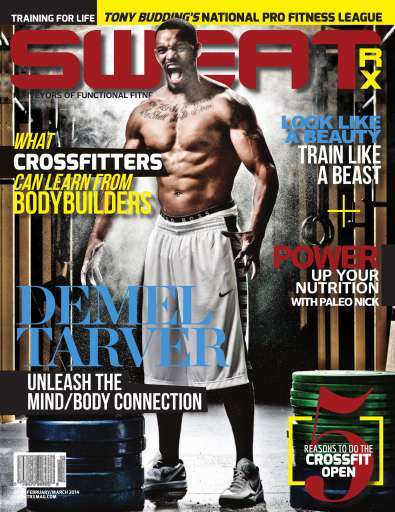 You'll receive 4 issues during a 1 year Sweat RX magazine subscription. You'll receive 4 issues during a 1 year Sweat RX magazine print subscription.